Rich Dragon has literally grown up with ALPCA. As a young lad Rich would drag his parents to license plate meets both locally and on the National level. Not content with observing the experts Rich dug in and got his hands dirty at an early age. Writing articles for the newsletter influenced him to become publications editor in 2000. He changed the name of the newsletter to "The ALPCA Register" and revolutionized the look and appeal of our house organ. A name change had been considered off and on for nearly twenty years with no action taken until Rich took control and made it happen. This periodical now rates not only with the best hobby club magazines, but also with professional journals, as a register of the activities inside and outside a segment of the transportation industry. We have a periodical of which we can be very proud, and we all participate in it. He developed the production process to be fully digital from creation and production through printing. Always humble, Rich has gone out of his way to thank all the pioneer editors from Asa Colby, Roy Carson, Robert Ward, Jim Crilly, Paul Maginnity, Bob Bittner to Tom Boyd for setting a standard that he has lived up to most admirably. Rich joined ALPCA in 1978 and has written the "Notes from the States" column for the newsletter for more than two decades. Rich was the youngest member ever elected to the office of Director serving from 1990 to 1992. Rich returned to the Board in 2004. Rich was coordinator and co-host of ALPCA's 50th anniversary convention held in Providence, Rhode Island in 2004. This convention, which many consider the best ever welcomed ALPCA back to New England where it all began in 1954. Rich is also a best selling author. 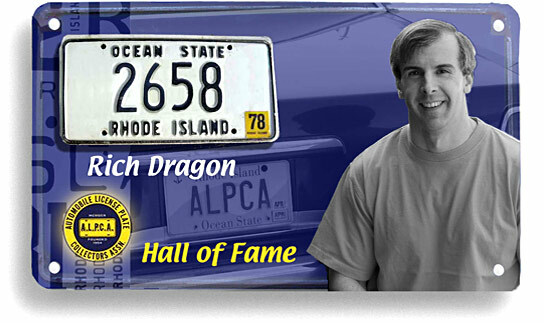 He has written the compelling history of Rhode Island license plates since 1904 entitled REGISTERED IN R.I. Noted collector and Hall of Fame member Conrad Hughson writes that the extraordinary level of detail in this book is a pleasure while at the same time the conversational style of writing makes it very accessible. Long time ALPCAN, Corb Moister writes that this book is written by a license plate collector with collectors in mind. As such, it gives an introduction to the language and mindset of license plate collecting. A certified public accountant and author Rich is a native of Massachusetts who has called Rhode Island home for over twenty years. For his tireless dedication and love of the hobby the membership is proud to welcome Richard E. Dragon to the ALPCA HALL OF FAME.